Although I’m only half-French, France is the only place I feel whole; I adore it, I understand it, I feel it. I go as often as I can with plans to move permanently in about 7 years so that I can have a view like this. But for now it’s just yearly trips which always seem to take place in the winter, which perhaps not the prettiest, is the most intimate. The Loire Valley holds my heart the closest I think. The first time I was there I felt instantly at home; I knew the back roads, I knew the buildings, I knew the people. I can’t explain how, it’s just one of those things, you know? 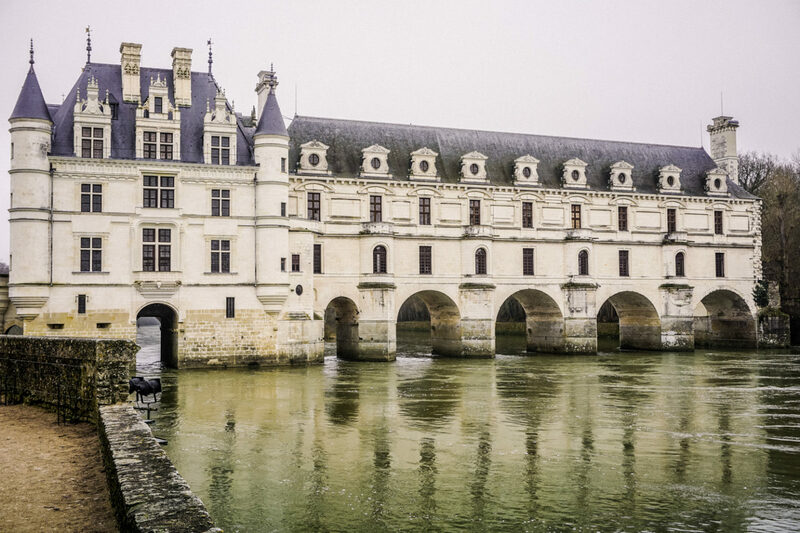 It was a very cold, dark, and windy day when I decided to forge out to Chenonceau (pictured above). I had never seen a picture of it, nor had I heard anyone ever talk about yet I knew the name and knew to go back. And on the day I went there was not another soul on site except for a handful of people working there. I literally had the place to myself. Of all the things I saw that day, the moment that was the most powerful for me was also the most quiet. I was on the 3rd floor in the hallway, standing still. All I could hear was the wind blowing through the windows and a slight banging of doors coming from some other corridor. Everything else was silent. Having this moment to myself gave me an experience that perhaps most visitors here don’t have. People rushing to see this room and that room. No one stops to hear the wind blow in the same way those who lived here before would have heard it. They don’t take in what a place like this means, they just take photographs. One of the things I love most about the Loire in the Winter, and Provence for that matter, too, is how quiet it all is. There’s a sense of just a little sadness in the air; nature is dead for the season, it’s cold (the mistral winds in the south! ), life seems a little harder but at the same time, there is a joy in the routine of the season. A beauty to. It’s in having the time to notice the wind, or in the case or Provence, the smell of the air. To see how cosy it is in restaurants from 12-2 because you just stop to eat and get warm with stew. In the winter, people have time to talk to you because they’ve claimed their home from the touriste. It’s in the conversation with a cheesemaker or winemaker and getting a little more of his secrets because you’ve had some time to develop a friendship – your a person instead of a passing face. There are so many beautiful, hopeful moments to just take it all in, to be. It’s why France has my heart in winter. And why I can’t wait to go back. Also a list of my favourite books dealing with France, Marie Claire Idees Magazine, a list of my favourite French inspired music and NY Mag has a great bit on where to buy beautiful vintage clothes! I’m lucky enough to live in France. My first castle was Chambord which was open for late night tours in the summer. We carried lanterns through the halls and up the winding stairs. It was also the first time I ever heard a live cuckoo in the forest. A magical time. Les Choristes is such a good movie! Give a listen to Autour De Lucie, my favorite favorite french band! That was beautiful. What you wrote, what you described, your words, the picture. Ahhhh. I like this. I had always wanted to go to France! Am from Singapore by the way. Beautifully written. I can help you dream a little more, as I am doing a series on French kitchens on Wednesday. I hope your 7 years from now, ends up being 5 or less! I hope to go to France someday. There’s just something about walking down narrow cobblestone roads with buildings on both sides that are four times older than the United States is. France is a marvelous, magical place. I love Château de ma mère and La gloire de mon pere. My two favorite French movies!